There are more choices than ever for breast implants to create the look that’s right for you. Extensive time and money have been spent on ongoing research to provide breast implants that are going to be the safest, best performing and longest lasting, giving women the most beautiful results ever. The latest introduction to the market is Allergan’s Natrelle Style 410 which received FDA approval February 28, 2013. This implant represents the most “gummy bear” like of form stable implants in a shaped profile. This style of implant is best for those women seeking a very natural, non-augmented look. The implant is shaped to give a very natural upper breast slope and provides a lovely contour. This style is also great for breast reconstruction and use in women that have very thin tissue and are at risk for, or have problems with rippling with other style implants. Sientra is a relatively new on the scene in implants in the US, but has been successful for many years in Europe and Latin America. They also have form stable implants that are more “Jell-O-like”. 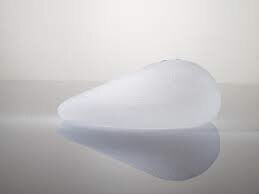 They also offer the shaped textured style of implant in two styles- classic oval and round based with higher projection at the lower part of the breast. Their products include round implants as well (smooth and textured). Mentor’s newest offering is the smooth Ultra High Profile for those women seeking maximum fullness and projection and desiring more fullness on the upper part of the breasts. Mentor and Allergan both offer a full range of smooth and textured, saline and silicone round implants, with different diameters and projections. If you are considering breast augmentation or revisional surgery of your breast implants, come in for a complimentary consultation to see and feel the new implant styles and discuss all your aesthetic options with Dr. Sardo.